I got my hands on some of the new larger Clover Amour Crochet Hooks and they are so fun to work with and pair perfectly with super chunky yarn! 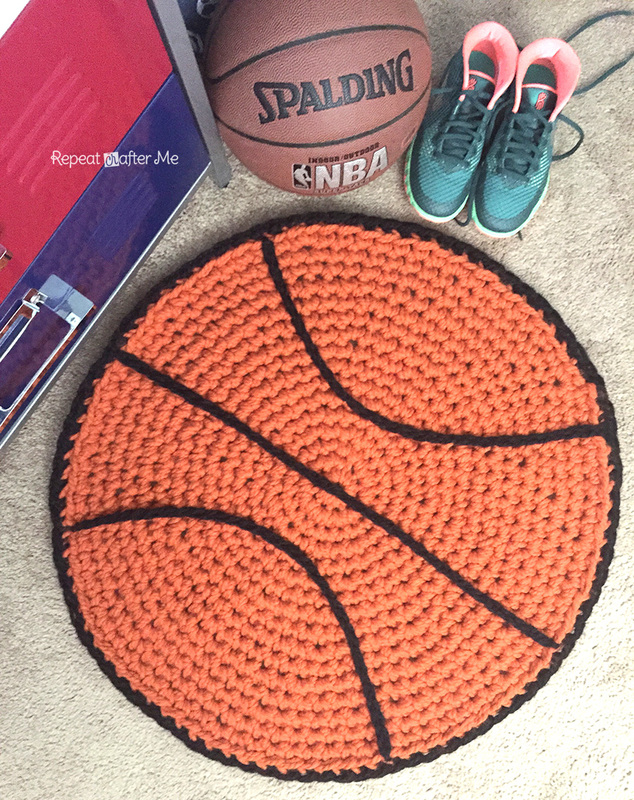 I created a quick and easy basketball rug from my sons sports themed room using two strands of bulky yarn and the P/Q 15mm hook. Much larger than your typical hook, but so comfortable and light! This project works up extremely quickly and there are so many options for embellishments. 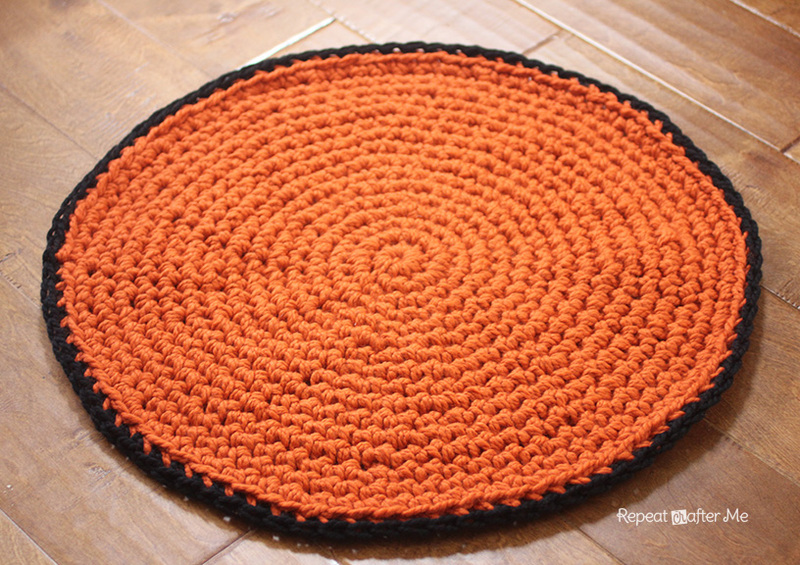 Think baseball, soccer, or just a fun multi-colored circle rug. Stay tuned for a girly version for my daughters room! – Lion Brand Wool-Ease Thick & Quick in pumpkin orange (4 skeins) and one skein of black for border and embellishments. Round 17: SC with only one strand in back loops only. Join, fasten off and weave in ends. Make 3 chains with black yarn of approx 40 chains long. Sew them on to rug with jumbo tapestry needle. Try not to weave needle through backside of rug… weave it in-between stitches and through the middle of the chains. 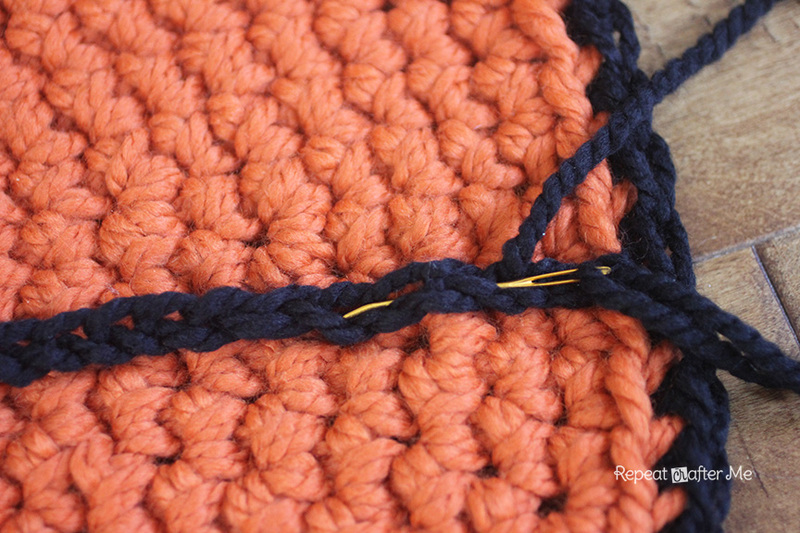 Start with the line down the center and then sew on two curved lines on either side. 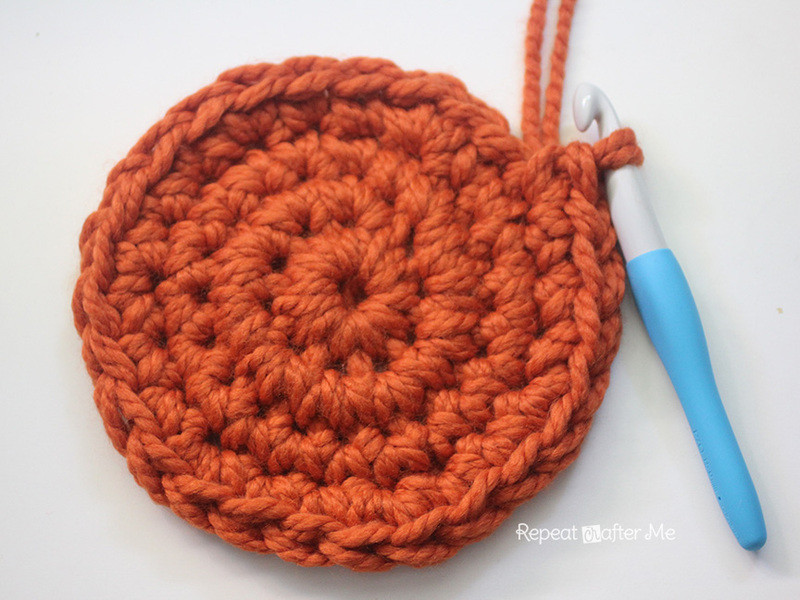 Click HERE for more information on the new larger Clover Amour Hooks and be sure to check back in early August to see more of these crochet hooks, the rug I’m making for my daughters room, and to enter a giveaway! Thank you to Clover Needlecraft for providing me with the chance to try out their new larger Amour Hooks. I was not compensated for this post and all thoughts and opinions are 100% my own. This is perfect for a basketball enthusiast. I love the rug! Those hooks look swell too. Thanks for the patten, can't wait for the next girly rendition. What is the completed diameter of this rug please? So special to see your son with this former pro basketball player. Is he now dreaming of a future as famous basketball player? 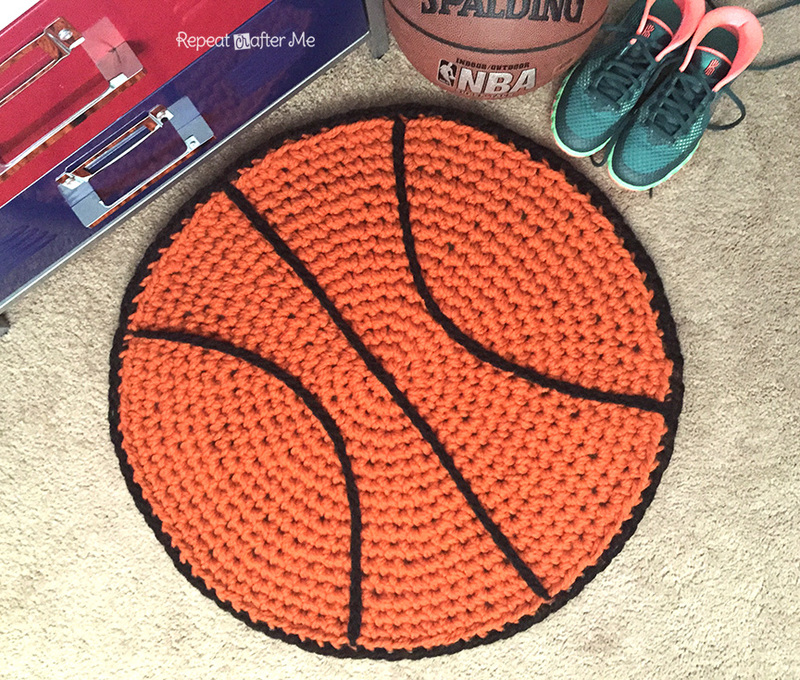 Great basketball rug for fans of this sport. This could also be a good start for making a pouf. This rug is so great! Very cute. I need one of those fab chunky hooks! 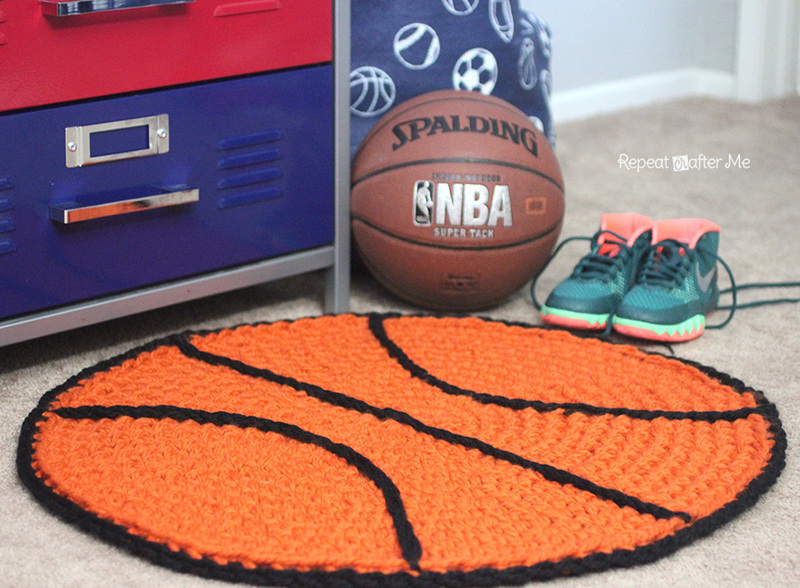 I know I have one of these to make in my plans this year, I have twins who are basketball NUTS. I hope I can make it as nice as you have here, I want to make it bigger too. Love it and thank you for sharing! Super cute!! What are the measurements? And about how long did it take to complete? What are the finished measurements of this rug?